This December marks Hamptons Take 2 Film Festival's (HT2FF) 9th year in the making. Started by documentary filmmaker Jacqui Lofaro, HT2FF brings the documentary film community together at the Bay Street Theater in Sag Harbor, New York every year. The 2016 program schedule was just released today, and while we still have to wait until December 1st for the festival to begin, we had the chance to speak with Jacqui herself to talk about the progression of HT2FF and what some of her favorite documentaries are. How and why did you start HT2FF? A few years ago, along with many other hopeful artists, I submitted a documentary film to a major film festival that didn’t make the cut. There were no sour grapes, but just the motivation I needed to launch an alternative festival; a more inclusive one that offered a ‘second chance’ to filmmakers whose work deserved a screening—a ‘take 2’ as they say in the movie business. And so the Hamptons Take 2 Documentary Film Festival was born, now 9 years young and running strong. How has your background as a documentary filmmaker shaped the format and energy of HT2FF? I recognize and honor films and filmmakers that deserve a closer look because I know how tough it is for documentary filmmakers to get their films made and even tougher to get them seen on the big screen by live audiences. I know how important perseverance and optimism are. My first documentary “The Empty Chair: Death Penalty Yes or No” took 8 years between production and fundraising to finish. After it received the prestigious Thurgood Marshall Broadcast Journalism award I felt the elation every documentarian experiences with recognition. That energy defines us. We are a festival that champions and celebrates the rich, diverse and challenging world of documentary film. Our mission continues to bring the work of talented filmmakers to new audiences. How has the festival changed since it started and what has stayed the same? In 2008 when I launched the festival we screened 5 films over a half-day. Now we screen anywhere between 25 to 30 films over 4 days, from 10 am to 10 pm. Our mantra is “all docs all day” with a special gala evening honoring a documentary icon. Over the years we have celebrated Richard Leacock, Susan Lacy, the team of Chris Hedgedus, D A Pennebaker and long-time doc champions Barbara Kopple and Stanley Nelson. This year we will honor award-winning filmmaker Alex Gibney with our Career Achievement Award. Because of our festival success, we have expanded our calendar and present a “Spring Docs Day,” screening several new and important documentaries coupled with panel discussions. What stays the same is our mission to share the unique art of storytelling through film to an ever-growing community of fans. Why is the festival held in Sag Harbor? We decided to focus on a single venue to make it easier for filmgoers to take in as many films as they wanted without having to shuttle between East End hamlets. It has proved to be a winning strategy as many tell us. In addition, Sag Harbor is a unique art center with great shops and restaurants. There is a lot to do between films. And our partnership with the Baron’s Cove, a hotel right in town, welcomes our festival fans for a convenient and comfortable stay. What is your favorite documentary film? Interested in learning more about HT2FF? Visit their website and read our interview with documentary filmmaker Lana Jokel, whose latest film "A Moment in Time: Hamptons' Artists" is showing at HT2FF's opening night, December 1st. What was the best way for us to kick off the Tribeca Film Festival? Premiere our own video series A Fairweather Moment at the New York Public Library of the Performing Arts. 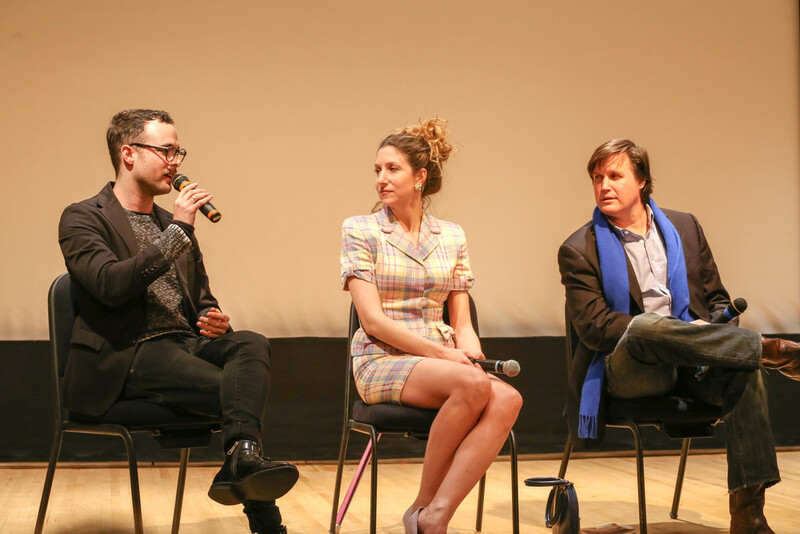 Last night, we welcomed guests to the Bruno Walter Auditorium for an exclusive screening of our first three episodes which featured the musically talented Carpenter siblings, Chef Stephanie Nass, and fashion designer Daniel Silverstain. Each interview, filmed within homes and workplaces, offered intimate views of the artists in conversation with Fairweather's Editor-in-Chief, Alexandra Fairweather. These short episodes act as mini biopics with Alexandra inquiring about the catalysts of the artists’ passions as well as having them show off their skills. The series will continue with more exciting interviews of various tastemakers and influencers around the city. 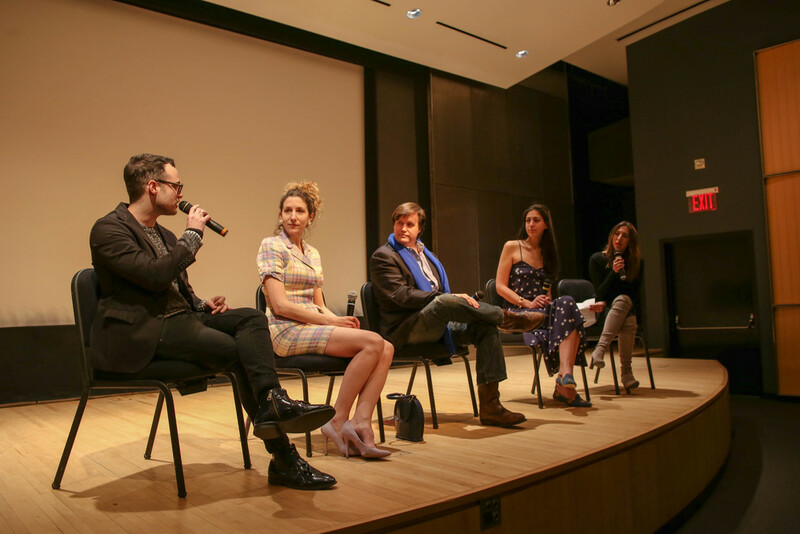 Following the screening, Stephanie and Daniel joined Guild Hall residents, poet Tom Yuill and novelist Iris Smyles onstage with Alexandra for an enlightening Q&A. With humor and a bit of existentialism philosophy, these artists discussed their works in relation to themselves and more importantly, New York City, a common thread which bound all four. Following the event, guests received bags filled with our organic juice and tea line Hottie Tottie as well as delicious cookies from Eleni’s Bakery in Chelsea Market. In all, this event was the perfect beginning to a week of great films and we are happy to have been able to bring the art of these talented men and women to a fantastic audience. Stay tuned for more videos in our A Fairweather Moment series. House of Cards star, breast cancer awareness role model, and successful single mother Joanna Going, sits down with us to discuss her roles as an actress and definitions of success. Have you always wanted to become an actress? What led you to attend the American Academy of Dramatic Arts after going to college for 2 years? I became interested in acting at the age of 14, when I got involved with a local theater company’s production of The Tempest in my home town of Newport, RI. I continued doing theater throughout high school, and when it came time to apply to colleges, I knew I wanted to study theater. The American Academy of Dramatic Arts had been on my radar, but, at 17, I wasn’t ready to move to New York, and wanted the more traditional college experience, so I joined the BFA Acting program at Emerson College in Boston. After two years there, I truly knew I wanted to focus on acting, and desired a more conservatory-type atmosphere. I took six months off to play Thea in The Incredibly Far Off-Broadway Ensemble Theater’s production of Hedda Gabler in Newport, and then moved to New York to attend the American Academy of Dramatic Arts. What has it been like to work on such a successful Netflix series House of Cards? How has that experience been different than filming other TV shows and movies, such as your current role on DirectTV’s KINGDOM? It was an honor, and a little bit intimidating to come in to the second season of House of Cards, a show that was flying high on the well-deserved success of their ground-breaking first season on Netflix. I had been a fan of the show from the moment it was released and was over-the-moon to be a part of it. As a guest part, albeit a recurring one, hopping onto a moving train and visiting for a while is quite different from being a part of the building of a new show from the outset, as is the case with Kingdom. Creator Byron Balasco, just named one of TV’s Most Powerful Showrunners 2015 by The Hollywood Reporter, has been very inclusive with the cast in discussions that shape the characters and the direction of the story lines. We are given a lot of freedom as actors to develop our roles emotionally and visually in a way that is setting the tone of the world where our show exists. We live in that world, we own it, and we feel validated to make the outrageous choices, or take the time to give attention to the small details that all add up to giving the richest life possible to Byron’s beautifully drawn cast of characters. Can you describe your work advocating for breast cancer awareness? There are several women among my friends and family who have battled breast cancer, including my daughter’s aunt, grandmother, and great-grandmother. The aunt, who is a dear friend, learned she had the gene markers for breast cancer, and opted to have a preemptive double mastectomy. It was a difficult choice, but a pro-active one. I admire her so much and I am grateful for her example to her daughters and nieces, who may also have an inherited propensity toward developing breast cancer, in letting them know that you can get out ahead of this disease, if necessary, beat the threat, and continue on with a healthy and happy and beautiful life. Education, awareness and early detection are the key in the fight against breast cancer. What was the process like creating a work-life balance with raising your daughter? Do you have any advice for women who want to have both a successful career and family? Once my daughter started school, I limited my work options to closer to home. It felt important to me to give her that consistency of always having a parent around, as well as an uninterrupted school life. I chose to take a step back from my work and focus on raising my child, and I was very fortunate that my then-husband was working on a very demanding hit TV show, and afforded me the chance to do that. I know the majority of women who work outside the home do not get the luxury of making that choice. During that period I threw myself into the work of running a home, taking care of a family, and went a little volunteer-crazy at my daughter’s schools, while continuing to audition and take the occasional close-to-home job. It made me happy, and I am forever grateful for the years I got to be THAT mom. But eventually, with the end of my marriage, I needed to get back to my profession in full-force, and for that it truly did take a village of friends, relatives, school, and nannies. My daughter and I are parent and child, but also a team, we support each other, and she has grown to understand what my work means to me. As necessary as it felt for me to be a mostly, stay-at-home mom when she was little, I am so grateful to now be able to show her what it means to be an independent working woman. To find a balance between work and family, you need to find the center of yourself, and know what satisfies you. There are no rules. Only what works for you and your family. If you are lucky enough to have a choice, and quit your job to stay at home and raise your kids and are miserable every second, that is not what works for you. If you go to work and cannot focus, devote your full attention to your job and find satisfaction in it because you are consumed with worry and the gut longing to be with your kids — then maybe you need a different arrangement. Of course, for many mothers there is not a choice: there is the necessity to work, and there is family to be nurtured. For everyone it is vitally important that you create a network of support for yourself and your children; extended family, friends, teachers, classmates. Nobody can do it alone. Take the opportunity to teach your children to build a community, and be willing to reach out when you need help. My immediate plan is to continue my work as “Christina Kulina” on Season 3 of KINGDOM, which begins shooting next week. Beyond that, it is my simple hope and prayer to be a working actress, with the ability to support myself and my family, long into my old-age. On February 10th, I attended the NY film premiere of Touched With Fire, a new film starring Katie Holmes and Luke Kirby as Carla and Marco, a pair of bipolar poets who meet in a psychiatric hospital and fall in love. According to the National Institute of Mental health, approximately 1 in 5 adults in the U.S.—43.8 million, or 18.5%—experiences mental illness each year. Film writer and director, Paul Dalio, did an excellent job of portraying the challenges and gifts associated with having a mental illness. But, what I found particularly striking about the film is how it explores the work of leading psychologist, Kay Jamison, who shows incredible links between manic-depression and creativity. Her research shows that many of the world’s famous artists including Lord Byron, Vincent Van Gogh, and Virginia Woolf had this link. When you realize that a large part of society’s greatest artist contributions stem from those effected by mental illness, I think it helps to take away the stigma of mental illness. I like the idea of not referring to this type of condition as a disease or illness. Hopefully one day it will be considered a gift (and that as we understand more, we will know how to deal with the tremendous challenges of this gift). That being said, please go see this important film. I hope that it will be a good starting point for all of us to begin discussing these topics further. Antoine Wagner is at work on an exhibition in Hamburg for May 2015 and plans to direct his first U.S. feature film. To learn more, visitantoinewagner.com.